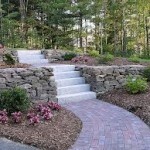 Crescent Design and Construction is family owned masonry company based out of Oak Hill, Virginia. We are fully licensed and insured to construct any outdoor home project, big or small. We have been in business for over 20 years and that experience shows in our work. Call us today for a free in-home consultation with our master contractor. We will talk about the details of your brick structure. We will take measurements of your property and enter those details in to our design software that will allow us to show you a preview of what your project will look like but it also allows us to give you a price quote on that same day. If you need help with any of the design aspects of your project, we have licensed architects and designers that can custom design something appealing to fit your needs and budget. Our masonry staff strives to always provide top-notch customer service, excellent craftsmanship, to finish on time and on budget, and most of all meet your expectations. We even offer a quality guarantee for every job. Whether you are looking to have a brick walkway leading through your garden, curving around your house, leading from your steps to your brick entry way, brick is always fresh design with a classic and timeless elegance. Brick is one of those versatile materials that can be added to a laid back design concept, contemporary, or even an over-the-top luxurious space and still fit right in. From brick walkways to outdoor fireplaces, brick adds an intimate design feature that catches the eye but doesn’t stand out. Brick walkways can be specifically used as a design feature; lining concrete sidewalks, in-ground pools or hot tubs and can be laid in many different design patterns. Talk to our designers and contractors about the different patterns available and how each pattern can add to your specific landscaping scheme. Choosing bricks for your walkways is always an easy design choice because of the various architectural styles that it is compatible with but even more, it is an excellent investment as it is one of the most durable materials on the market. 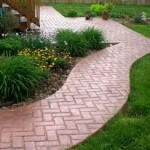 Brick walkways can last for many, many years and be enjoyed for generations to come. With that said, knowing what kind of maintenance is required for whatever kind of outdoor structure that you choose is important. For instance, for stained concrete, you must have it sealed immediately and one to two years after that. Without proper maintenance, you could spend a significant amount of money in repairs. Here are a few design Ideas for installing brick walkways on your property to enhance the esthetics and functionality of your home. Mix & match different materials within your brick walkway to add character to the design. 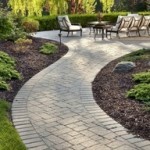 For example, when you mix reclaimed bricks with natural stones, your walkway gets a natural and cozy look. You can use bricks with cobblestones and even concrete. Mixed brick walkways look best around gardens and country settings. If you are adding a walkway that is meant to be used often by yourself and your family, consider choosing an extra wide walkway so that multiple people can enjoy the walkway at once. 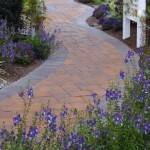 Create a simple walkway with a typical pattern and no turns or curves. 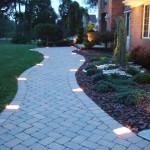 Design your walkway to starts from the front of your property and leads straight to your door. This design concept is best when you have too many other design features going on. The walkway won’t take away from any of the other features of the way. Think ahead with a sand base for your brick walkway. Using a sand base will hold the bricks in place regardless of the weather trauma to your walkway. Want an aged, distinguished look? Try using the sand base method with dark red bricks. Create wonder and excitement by adding a few extra small bricks as stepping stones that lead off of your walkway to additional areas of your yard. At Crescent Design and Construction we strive to bring you the best products in the industry that will last and really add to the exterior design of your home. A brick walkway always looks like it has a story to tell and you just want to follow it! We currently offer services to Arlington County, Fairfax County, Oakton County, McLean, Clifton, Fairfax Station, Great Falls, Oak Hill, Ashburn, Falls Church, Alexandria, and Burke Virginia. And that’s just to name a few! We are conveniently located in Northern Virginia which allows us to serve our neighbors in Maryland and Washington D.C. as well. Call us today at (703) 665-3545 for a free in-home consultation by our masonry experts!